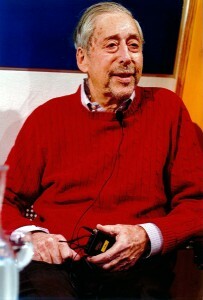 Jerry Lindenstraus talks to German school pupils at the headquarters of the Schwarzkopf Stiftung in Berlin in December 2013. Over six-feet tall, impressively agile for his 84 years, and sharply dressed, long-time LBI volunteer Jerry Lindenstraus cuts a striking figure. His faintly continental accent leads many people he meets to ask him where he’s from. That’s not such an easy question to answer. “When I tell them that I lived in Danzig, most people nod in recognition. If I say I’m from the area near Konigsberg, then only a few people have anything to say. If I tell them the name of the town I was born in, people just shake their heads, ‘Never heard of it!’ ” Lindenstraus recently told the German TV-journalist Wolf von Lojewski in Berlin. Gumbinnen, where Gerd Lindenstraus was born in 1929, was a town of 20,000 in the eastern exclave of Weimar Germany on the Baltic Sea known as “East Prussia.” Von Lojewski needed no further elaboration on Gumbinnen—he grew up just 80 km away. 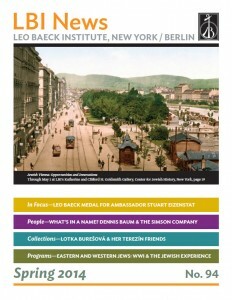 The two East Prussians discussed Lindenstraus’s roots in Gumbinnen and his remarkable life story during an event at the Centrum Judaicum in Berlin’s Neue Synagoge on December 18, 2013. It was one in a series of events that Lindenstraus participated in during a week-long trip sponsored by the Foundation of the Memorial to the Murdered Jews of Europe. Unlike von Lejowski’s family, Germans expelled by the Red Army in 1945, Jerry Lindenstraus left East Prussia because his family was Jewish. The Lindenstraus family had owned the second-largest department store in Gumbinnen since 1883. In 1933, they were forced to sell their assets at a fraction of their value and moved to Danzig (Gdansk). After his parents’ divorce, he went to live with his father in Konigsberg (Kaliningrad). In that easternmost city in the German Reich, once renowned as an intellectual hub and the home of the German Enlightenment philosopher Immanuel Kant, he witnessed the Kristallnacht in November 1938. That night, the Jewish school that Jerry attended was burned to the ground, along with two of the city’s synagogues. His mother fled to Colombia that year, where she found her footing relatively quickly. Jerry’s father tried in vain to secure a visa until 1939, when he bought tickets on the Scharnhorst, a German luxury liner, on its last civilian voyage before being converted into a troop ship. The destination was Shanghai, the last refuge for over 20,000 German and Austrian Jews who were able to enter the city without a visa, but became trapped there as stateless refugees in the most precarious economic and social position. Life was difficult for the refugees in Shanghai, however, and Jerry’s father died of tuberculosis shortly after his arrival. After eight years in Shanghai’s Jewish ghetto, Hongkew, Lindenstraus joined his mother in Colombia; they had not seen one another in 10 years. In addition to the audience at the Neue Synagoge, Jerry Lindenstraus shared his story in a video interview that will be archived at the Memorial to the Murdered Jews of Europe. It will become one of 150 first-hand testimonials that will be available in the Visitors Center at the memorial near the Brandenburg Gate in Berlin. Lindenstraus, Jerry. Eine unglaubliche Reise. Constance: Hartung- Gorre Verlag, 1999.